Lucy Hallden gasped. Just in front of her, in the Maple Leaf Stables, a new horse was being led out of a horsebox. "Oh my goodness!" She silently cried. "That poor horse!" For the horse was filthy. His mane, which had once been beautiful and flowing, was matted with mud. His coat, which had once been shining and glistening, was caked with filth and sweat. Lucy was so shocked she couldn't say a word. When she did find her voice, she spoke to Matt Heathers, the instructor that was leading the horse out. "Wha...what happened?" She said in a horrored whisper. "He was neglected. His owners went on vacation and left him in their barn without a stable boy to look after him. He became crazy with hunger and fear, tore loose from his stall, and escaped. We found him, half dead and starving, trying to eat some wild blackberries. We took him in and brought him here." "How awful!" Said Lucy. "Poor boy. What's his name?" "The name on the front of his stall was Nigel." "Nigel. Poor Nigel. So your horrid owners neglected you did they? Then they forgot about you. Poor Nigel!" She murmured to the trembling horse. He whinnied in reply and nuzzled her shoulder. "Are you going to keep him here at the stables, Matt? Or are you going to find him a home?" "Well... we had decided to sell him when he got better, would you like to help me groom him? "Oh yes!" Said Lucy excitedly. "I'd love to help!" So she did. For the next week, Lucy nursed him like a baby, and by the end of the week she had an idea of who could keep Nigel. Herself! It wasn't like she didn't know how to ride and didn't have a stable. She had had her own horse 3 years before, but he had died of colic. So she persuaded her dad. In the end he said yes, because he was tired of her whining at him, and bought the horse. And from that day on until his death, Nigel was treated like a king by the 12-year old girl that saved his life. 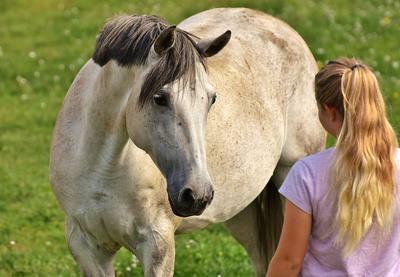 Very sweet - I can tell you're truly a horsecrazy girl!